The Mission Statement of the Vail Valley Lacrosse Club is to teach and support the values of character, honesty, sportsmanship and excellence through the game of lacrosse. 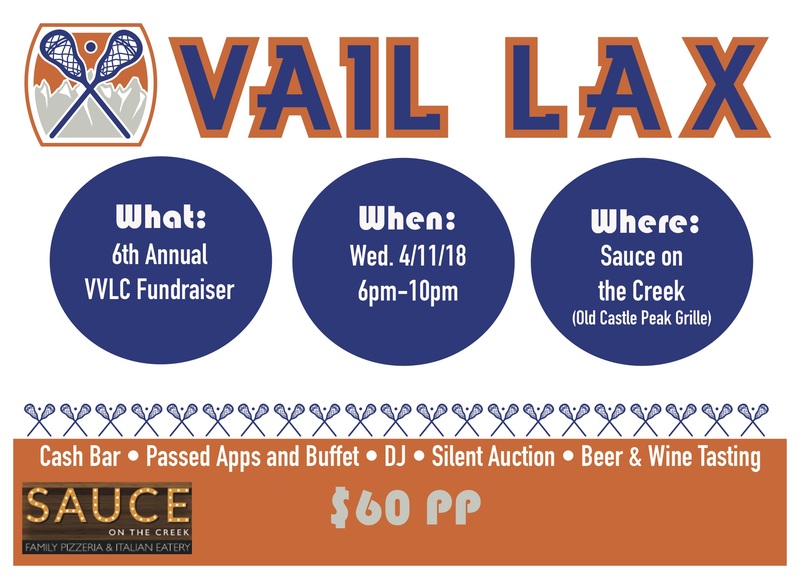 April 5, 2018 – Edwards, Colo. – The Vail Valley Lacrosse Club (VVLC) is excited to announce a new location for its annual spring fundraiser. Slated for Wednesday April 11, 2018 at Sauce on the Creek (Sauce), the newest addition to Avon’s dining scene, the event treats attendees to an evening of fun and entertainment while raising funds for the rapidly growing non-profit. Proceeds from the event and its attendant silent auction benefit the community in a number of ways. In addition to offsetting club fees for participating members, the fundraiser directly underwrites the creation of multiple scholarships, enabling program access for an ever-widening group of families and players from across the valley. Priced at $60, tickets for the event are available to the public for purchase. Each includes two drink tickets plus passed appetizers and a buffet, both generously provided by Sauce. The fundraiser also hosts a robust silent auction. Items include wine, a specially branded Vail Lax longboard from Street Swell, tons of ski and bike gear and a generous selection of gift certificates valid for dining, individual coaching, BOLing and a wide array of services.